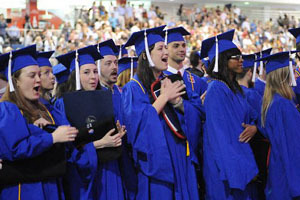 On May 12 and 13, American University students in the class of 2012 became graduates and alumni. Photographers caught their nervousness, excitement, encouragement of their peers, and thanks to their families and friends on camera. Graduates will cherish these memories as they set out on the next phase of their journeys. Relive the best of the ceremonies and celebration by watching the highlights video at www.american.edu/commencement/2012. Continue to share in the excitement on the American University Facebook page. More than 3,500 arrived on campus commencement weekend as students and left as 2012 graduates of American University after a weekend of commencement ceremonies. In five ceremonies, distinguished leaders in their fields and the university’s deans, provost and president celebrated, thanked and honored students for their academic achievements and contributions to the university community. Inspiring speeches from Associated Press president and CEO Tom Curley, Calvert Investments CEO Barbara Krumsiek, USAID administrator Rajiv Shah, former White House chief of staff Erskine Bowles, and Smithsonian Institution secretary Wayne Clough sent graduates into the next phase of their careers with words of encouragement and a charge to continue a life of service. Watch the commencement speeches by the guest and student speakers. Washington College of Law’s Commencement took place on May 20, featuring keynote speaker Valerie Jarrett, senior advisor to President Barack Obama and chair of the White House Council on Women and Girls.